Where do you live? Is this where you grew up? Tell us about your childhood. I was born and grew up in Toronto, Ontario, in a neighbourhood called The Beach or Beaches, depending on who you talk to. When I was growing up there, it was a mixed neighbourhood in terms of income. Across the road lived a retired streetcar conductor. As kids, we used to visit him in his garden. He let us have some of his fresh radishes or runner beans, his wife would bake cookies and he'd tell us stories. Every Saturday and Sunday morning, my sister and I would visit our Nana, who also lived across the road. She'd tell us stories about a monkey named George (not to be confused with Curious George). When we got older, the stories would be about her childhood and her family's experiences in World War II. At family gatherings, I'd get a different perspective of this time with stories from my mother and aunt. Those were innocent times, when children ran loose in the streets. In the case of me and my friends, our neighborhood included the boardwalk, beach, and a swath of woodland called the Glen Manor Ravine. We'd role play we were medieval warriors (Les Dames de Williamson), running around in tunics my mother made us and waving wooden swords. I think I can safely say that, though I grew up in Toronto, I grew up on stories and by age twelve I was starting to write them. Which is the first book that you wrote? What inspired you to write it? I started off writing science fiction largely inspired by Star Trek and Robert Heinlein. I started writing a Canadian version of Space Cadets, but lost the manuscript when I left it in the women's washroom at Ryerson University. I also lost my class notes, but that was not a big deal. I took terrible notes. 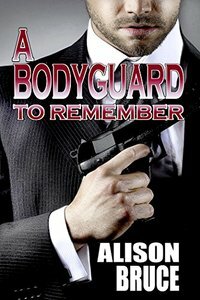 The first novel I completed I started while recovering from surgery. The first draft was written in longhand while I was still in hospital. What inspired me? A deep seated need to look busy so one of my roommates would stop bugging me. I was also inspired by Louis L'Amour and the Canada-France-US made series Bordertown. After many rewrites and other adventures, my first novel completed became my first novel published: Under A Texas Star. You write history, mystery and suspense. Do you also enjoy reading these genres? Which is your favorite book? I write the kind of novels I enjoy reading. That's why there's always a bit (or more) of romance and a generous helping of humour as well as a mystery to solve. 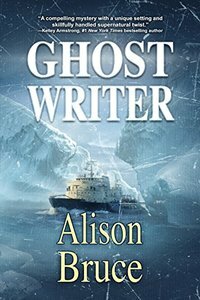 Since I also love a good ghost story, Ghost Writer is my favourite book of mine to date. It has it all. What are the qualities that you ensure your characters essentially have? Why? I avoid giving my villains antisocial personality disorder. I'm not that interested in "psycho killers." I'm more likely to give my heroes mental health issues so they can deal with them. Perfectly good heroes are as boring as perfectly evil villains. I write strong women protagonists who are thrown into unfamiliar waters and need to learn to swim. Generally, none of my female characters are whiny, petty or weak. This doesn't mean they can't whine occasionally or indulge in a petty remark or a moment of weakness. There are no dumb blondes or maidens in constant need of being rescued. They aren't perfect heroes either. All of the above applies to my male heroes as well. Out of the four novels that have been finalists for genre awards, which is the most special to you and why? I'm just finished republishing Deadly Legacy now that the rights have reverted to me. This prompted me to reread the book and I'm happy to say, I still love it. It was a finalist for the Arthur Ellis Awards for excellence in Canadian crime writing. I'm very proud of that. What are the jobs that you have worked before your current one? How have those experiences influenced your writing? My worst jobs have been mitigated by prompting me to escape my situation, at least in my head. Those escapes have lead to stories, made up while I worked. This is why I was a better dishwasher than file clerk. One of the best jobs was when I was a partner in Women's Work. We published a day planner for and about Guelph women. For every month there was story reflecting the theme of the year. I interviewed the women for the stories for the first year and edited their writing in subsequent years. I met women I probably would never have come across otherwise. I read and heard stories far outside my own experience. I've been a comic book store manager, an administrative assistant to an environmental consultant, and for a short while, I was a junior technician in an optical lab. 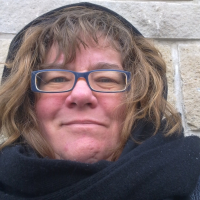 I edited and wrote for an online food magazine, wrote freelance for business and community journals and was lead curator of a Star Trek exhibit at the Guelph Museums, which also went to the Ontario Science Centre. Just about every job I've done has been grist for the mill. What is Crime Writers of Canada? How does your job as the Executive Director of the organization inspire you to write? Crime Writers of Canada is the professional organization for Canadian authors of mysteries, thrillers and crime nonfiction. I'm not sure I can honestly say that my job inspires me to write, but my writing mysteries and suspense definitely helps me serve our members. On the other hand, being a member of CWC has been a big help to my career. What inspired the story of ‘Ghost Writer’? Have you had any paranormal experiences yourself? Those experiences coupled with my love of supernatural stories inspired how I treated the ghosts in Ghost Writer. Jen Kirby can see them, but not hear them, like I was able to see my grandmother but not hear her say good bye. She can feel their presence as a physical sensation, like I could feel my mother-in-laws presence when I was nursing son. Of course, I magnify and expand Jen's abilities. 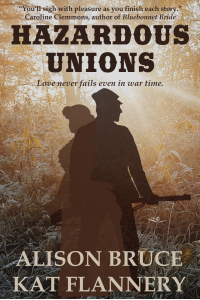 How many books are planned in the Men in the Uniform Series? That's tricky. The company that published that book is no longer publishing. Their business has shifted. I may write more in the series or I might start a new series. Which is the next book in A Carmedy & Garrett Mini-Mystery series? When is it planned for release? My publishers are dropping like flies. The rights to Deadly Legacy and Deadly Season have reverted to me and have been re-released by Deadly Press. I am currently updating Deadly Legacy, then there is a third book to finish. It may stick at being a trilogy. Who do you dedicate ‘Deadly Season’ to? Deadly Season is dedicated to our family cats and my uncle's dog Nelly, who is the name sake for the Human Remains Detection dog in the book. You co-authored Hazardous Unions with Kat Flannery. What was the experience of writing a book with someone, especially Kat? Working with Kat was a lot of fun. We hardly knew each other when we started out. Our publisher introduced us. And we have yet to meet in person. But I count her among my good friends. It was an interesting process writing Hazardous Unions. The stories are separate but connected. We had to create the family history for the twin sisters, which we tweaked constantly as plot point required. How do you feel about the shift of reading from physical books to digital ones? Which one do you prefer? I prefer reading physical books most of the time but I am very grateful to be able to carry around a selection of books on my smartphone that I can access whenever I'm stuck waiting for an appointment or one of my kids. E-books have also enabled me to try out the works of many authors I might not have discovered otherwise. Which is the next book you are writing? Give us an insight into it. Right now I'm re-writing Deadly Legacy, putting it into first person and updating the tech. For instance, when I first wrote it, I anticipated the smartphone. Well that's old hat now. I want to get that off my plate ASAP. The next Ghost Writer book is in progress. This one takes Jen Kirby to cottage country and ties into a ghost story Jen and I share from the first book. I'm also working on a new standalone romantic suspense set in World War II. It draws on all those stories my Nana, mother and aunt told us and makes use of my BA in history. 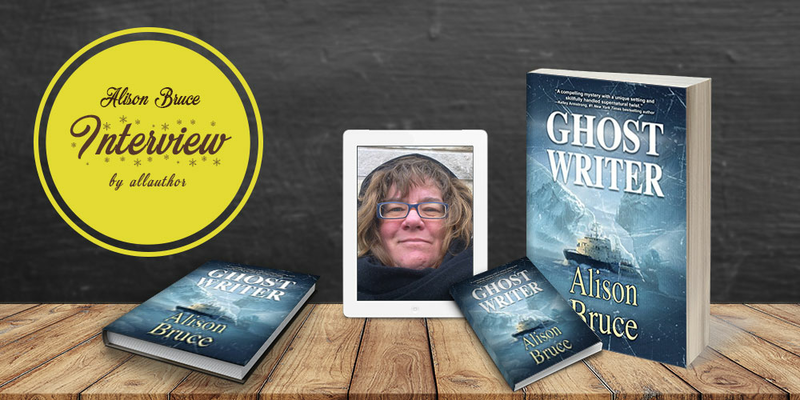 Born in Toronto, Ontario, author Alison Bruce grew up in a neighborhood that included the boardwalk, beach, and a swath of woodland called the Glen Manor Ravine. Alison started off writing science fiction largely inspired by Star Trek and Robert Heinlein. 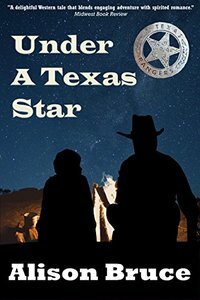 After many rewrites and other adventures, her first novel completed became her first novel published: Under A Texas Star. She writes the kind of novels she enjoys reading and avoids giving her villains antisocial personality disorder. She writes strong women protagonists who are thrown into unfamiliar waters and need to learn to swim. 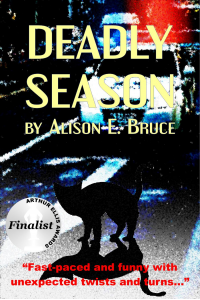 Her novel "Deadly Season" was a finalist for the Arthur Ellis Awards for excellence in Canadian crime writing. She has been a comic book store manager, an administrative assistant to an environmental consultant, and for a short while, she was a junior technician in an optical lab. One of the best jobs was when she was a partner in Women's Work. Being a member of CWC has been a big help to her career. Right now she is re-writing Deadly Legacy, putting it into the first person and updating the tech. The next Ghost Writer book is in progress.